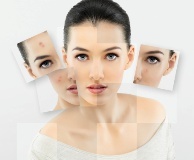 Acne is a problem that most of us typically associate with our teenage years. But many continue to suffer from breakouts well into adulthood. Adult acne, especially in women, is often caused by changes in hormones. For instance, if a woman is taking birth control pills, she may suffer from breakouts of acne. Treating adult acne often involves something as simple as altering your diet or it can involve using a variety of cleansers and soaps. The downside to this is that many of these products use harsh chemicals that can lead to further irritation and make the flare-up of acne even worse. Natural remedies for treating adult acne are a gentle alternative to mass-produced acne treatments that have much the same, if not better, effect that will leave your skin free of blemishes. Derived from the Australian Melaleuca alternifolia tree, this is a less irritating, natural way to treat mild to moderate adult acne breakouts. It has the same antiseptic properties as benzoyl peroxide without causing irritation; in fact, it is good for soothing inflamed skin. Naturally-occurring acids such as alpha hydroxyl, found in citrus fruits, and azelaic, derived from whole grain cereals and animal products is another effective, natural treatment for adult acne, removing dead skin cells and reducing acne scars. The Mayo Clinic notes that alpha hydroxyl can cause redness and irritation. Taking a zinc supplement as a natural remedy for treating adult acne is an excellent way to reduce inflammation and heal wounds caused by acne. Because supplements can have a negative after-taste, taking them with food is recommended. Though the jury is still out on the effectiveness of this natural adult acne treatment, WebMD says there is evidence that manuka honey, a product of New Zealand, does have benefits due to honey’s wound healing and anti-bacterial properties. It is being used as an ingredient in face and body washes. This method uses one of the 12 essential salts that occur in the human body, calc sulph, to treat skin conditions such as acne. An essay by Loyola University says that ingesting large amounts is dangerous so the salts are diluted and given as either a small pellet or powder that is taken under the tongue for faster absorption in the blood stream. If you’re in your 20s to 40s and still prone to acne, you should consider looking at your diet. Cutting back on high-glycemic index carbohydrates such as white bread and food with high sugar content can also contribute to adult acne. However, it should be noted that fruits and veggies get a pass. Natural adult acne treatment may even involve something as simple as washing your face with cold water. It’s recommended to use only warm water as hot water can cause skin to dry out, leading to the production of more oil which, in turn, leads to pores being blocked and breakouts of acne occurring.